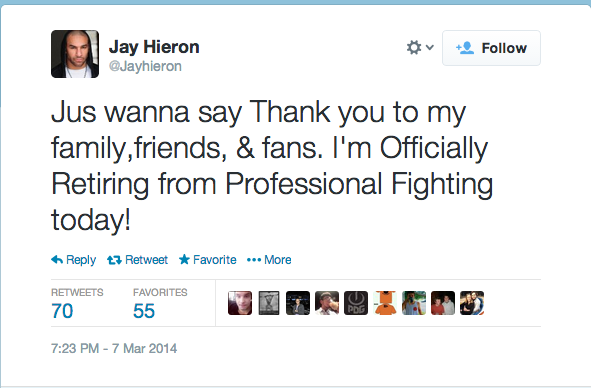 Long time fighter, Jay Hieron retired from MMA today. Hieron was a veteran of the sport, having competed in several major organizations: UFC, WEC, Affliction, Strikeforce, and Bellator. He was a NJCAA Junior Collegiate Wrestling Champion, the final IFL welterweight champion, and Bellator’s season 4 welterweight tournament winner. Hieron’s final record is 23-7 — he’s faced some truly elite competition– standouts such as Georges St-Pierre, Ben Askren (controversial split decision), Jake Ellenberger (1W – 1L), and Tyron Woodley. Previous articleIs a Big WMMA Fight Imminent? Dana White confirms Gina Carano and Ronda Rousey false.